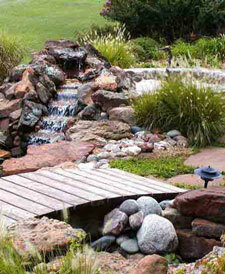 Saluppo Landscaping specializes in the design & construction water gardens and waterscapes. Our innovative solutions have been tested and proven in the industry for many years. From design and construction to maintenance, we provide the services you need. Our Professionals will visit your home/office to understand your requirements and base on the layout of your premises, design a Pondscape that will be both aesthetic and functional. Our main goal is to create a waterscape that is beautiful and natural looking, while requiring minimal maintenance and operating expense. We have designed, created, and maintained many successful waterscape projects locally. We would like to assist you in creating a quality, natural looking waterscape that is properly suited to your requirements. Watching colorful fish swimming in a pond decorated with aquatic plants and experiencing the sight and sound of flowing water are just a couple benefits of pond keeping. If building or remodeling an ornamental pond, consider several principles to give your aquatic creation a natural, aesthetically pleasing appearance.